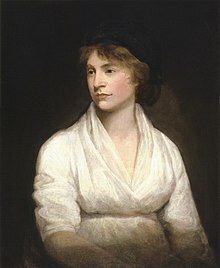 Mary Wollstonecraft (/ˈwʊlstən.krɑːft/; 27 Aprile 1759 – 10 September 1797) wis an aichteent-century Inglis writer, filosopher, an advocate o weemen's richts. In her brief career, she wrote novelles, treatises, a traivel narrative, a history o the French Revolution, a conduct beuk, and a childer's beuk. Wollstonecraft is best kent for A Vindication of the Rights of Woman (1792), in that she argies that weemen are nae naiturally inferior tae men, but appear tae be anerly acause thay lack eddication. She suggests that baith men an weemen shoud be treatit as raitional beins an imagines a social order foondit on raison. Till the late 20t century, Wollstonecraft's life, that encompassed several unconventional personal relationships, received mair attention than her writin. Efter twa ill-fatit affairs, wi Henry Fuseli an Gilbert Imlay (bi that she haed a dochter, Fanny Imlay), Wollstonecraft mairied the filosofer William Godwin, ane o the forefaithers o the anarchist muivement. Wollstonecraft dee'd at the age o 38, eleven days efter giein birth tae her seicont dochter, leavin behind several unfeenished manuscripts. This dochter, Mary Wollstonecraft Godwin, becam an accomplished writer hersel, as Mary Shelley, that's best kent wark wis Frankenstein. Efter Wollstonecraft's daith, her widaer published a Memoir (1798) o her life, revealin her unorthodox lifestyle, that inadvertently destroyed her reputation for awmaist a century. Houiver, wi the emergence o the feminist muivement at the turn o the twentiet century, Wollstonecraft's advocacy o weemen's equality an critiques o conventional femininity becam increasingly important. The day Wollstonecraft is regairdit as ane o the foondin feminist filosofers, an feminists eften cite baith her life an wark as important influences. This page wis last eeditit on 10 September 2018, at 05:47.